Lower temperatures this time of year have increased people’s use of space heaters. These units, while small in size, pull more energy than expected, especially in older homes. Without an upgraded electric service, circuits overload and breakers trip when this type of appliance is added to a line while other devices are in use. To be clear, when I say “overload” I mean a response to a circuit when many things are plugged in and running at the same time. A response can range from dimming lights to actually tripping the breaker. A breaker is designed to trip “off” when the power load (measured in watts) exceeds the amount of amps a single circuit breaker can handle. Most circuit breakers in your service are 15 amp. Conservatively, on a 15 amp breaker you can use 80 percent of its amperage all at once, which is 12 amps. This means no matter which outlet you’re using on a particular circuit, or how many things you have plugged into it, the total load should not exceed 12 amps or you risk tripping the breaker. The question becomes, how is someone supposed to know how many amps are being pulled based on watt usage? There’s a formula — watts/volts=amps — and once you know what numbers to plug in (pun intended), it’s easy to calculate. FYI, in the U.S. our lines are 120 volt, unless doubled for larger appliances, becoming 240-volt circuits. You should also know what switches and receptacles are on what breakers. Breaker box mapping can be disheartening in older homes where you’ll discover several rooms, including a bathroom, are all on one 15-amp breaker — hence the bedroom lights dimming when someone uses a hair dryer in the bathroom. Here’s a practical example: If you’re using a 1200-watt microwave on a 120-volt line, it will pull 10 amps (1200w/120v=10amps), leaving you with only 2 amps on that circuit (remember, max usage on a 15-amp breaker is 12 amps). So let’s say while you’re heating up a plate of leftovers, on the same circuit, someone starts up a 1500-watt space heater … pop, that breaker will trip (1500w/120v=12.5amp, plus the 10 amps from the microwave, a total of 22.5 amps) well exceeding the 15-amp breaker. Receptacles that serviced homes built several decades ago fall short given today’s demands from electronics, appliances, etc. One outlet in a medium-sized room sufficed back in the ’30s and ’40s. Today, the standard electrical code is one receptacle every 6 feet. While an older home may only have a 100-amp service, today the same size home will have 200-amp service or more. 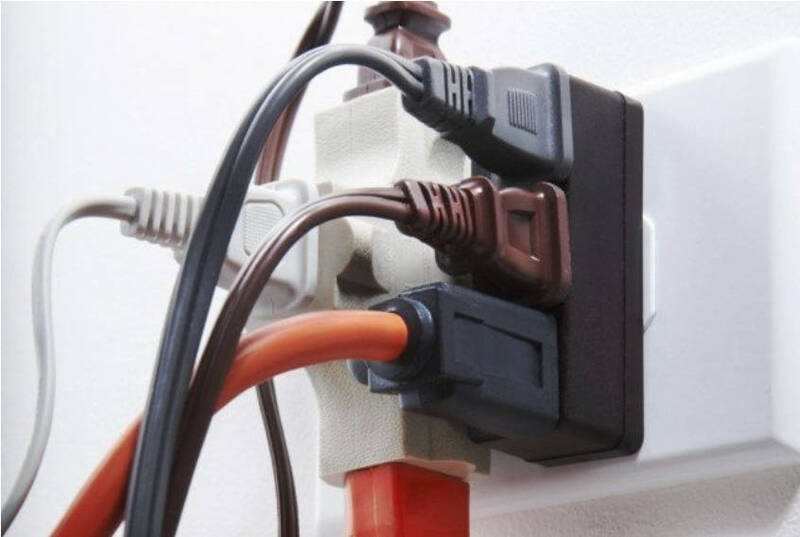 The truth is it doesn’t matter if you have two or 200 outlets on one circuit (to exaggerate a point); it will only overload if you’re using more amps than what that particular circuit breaker is designed to handle. When we add a space heater or any device that pulls hundreds of watts at once, we should always assess what other devices are on the same circuit that may run simultaneously. Splitting up the number of outlets being used to multiple breakers will solve an overloading problem. I make this statement provided there are no age-related issues in your wiring, such as worn-out insulation. At any rate, adding breakers to your service is definitely a job for a licensed electrician. A good electrician will first determine the condition of your wiring, if you can add breakers to your existing service and if your service panel needs upgrading (and what permits may be required), and give you an estimate of how much the project will cost.